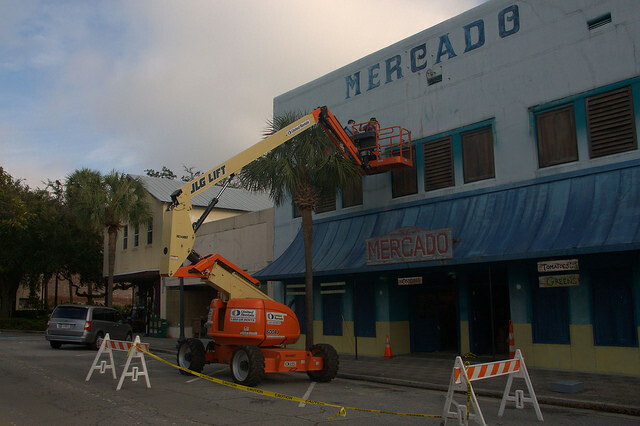 The south end of Newcastle Street, in Brunswick’s Old Town National Register Historic District is getting a dose of Hollywood special effects this week as crews prepare the area for filming the upcoming Ben Affleck movie Live By Night, based on the bestselling novel by Dennis Lehane. 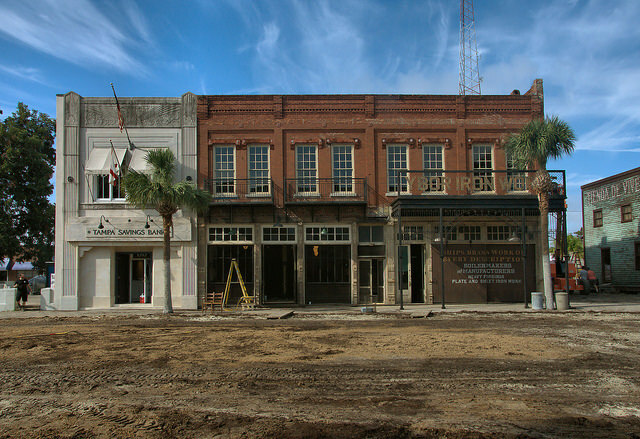 Brunswick was chosen to fill in for Prohibition-era Ybor City, the now-trendy Tampa neighborhood known as the center of the American cigar industry for much of its existence. 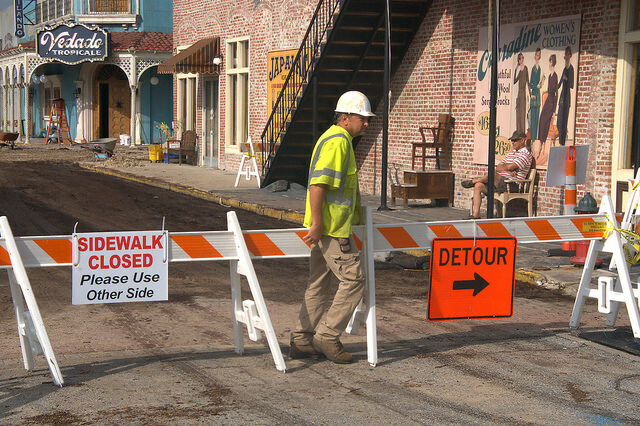 It was an eye-opening experience for me to see this process in action. 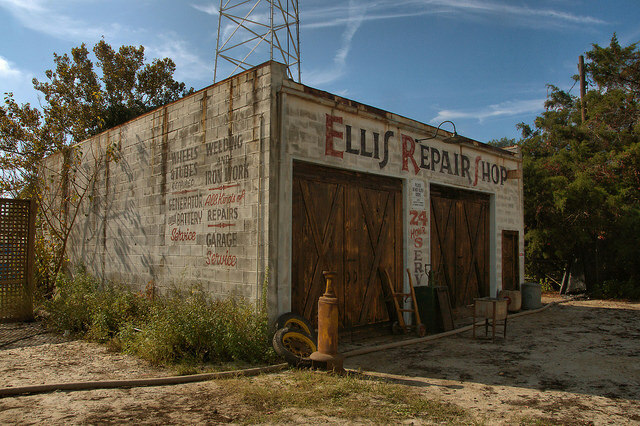 I’ve photographed several abandoned set locations in my endless travel throughout Georgia in the past decade, but the vitality and energy of these crews gives me a new appreciation for everything that goes into making a movie. And it doesn’t hurt that I’m a big fan of Ben Affleck’s work. 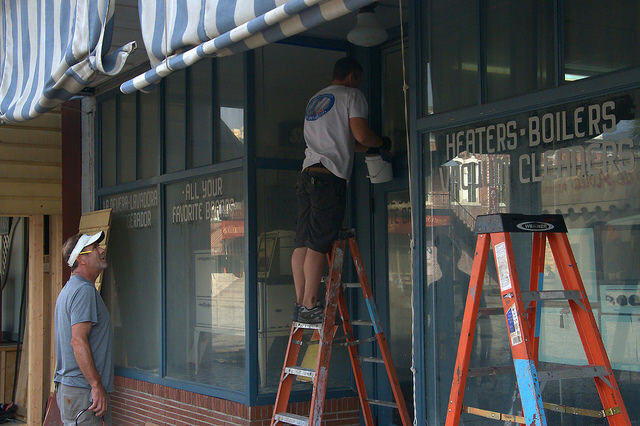 Most of the work is cosmetic, with paint and signage appearing on familiar storefronts. 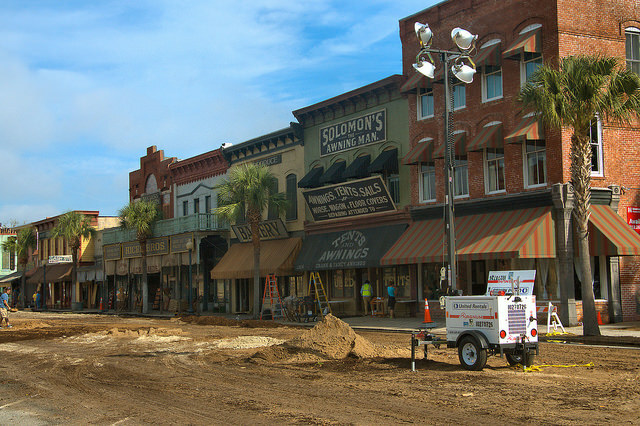 The magic of filmmaking insures that nearly all these places will return to normal soon after the movie wraps. 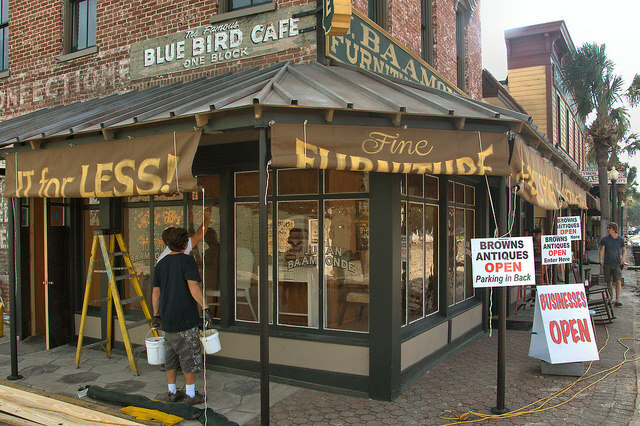 While two local artists take a break beside a mural at the corner of Newcastle and Monck Streets, carpenters help put the finishing touches on a period furniture store. 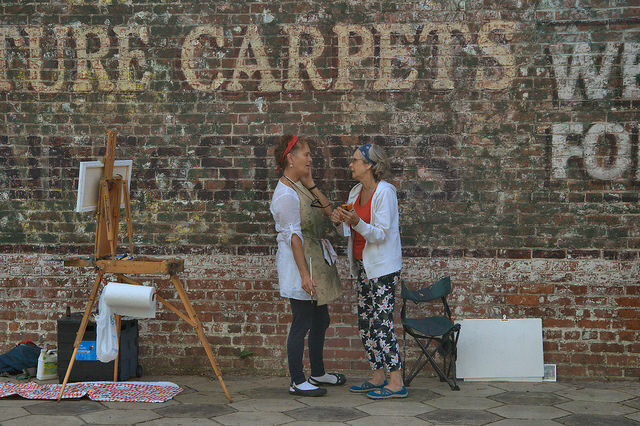 As a photographer of fading rural Georgia, I see signs and murals like these quite often, but I tip my hat to these artists, especially the attention to detail. It’s amazing! 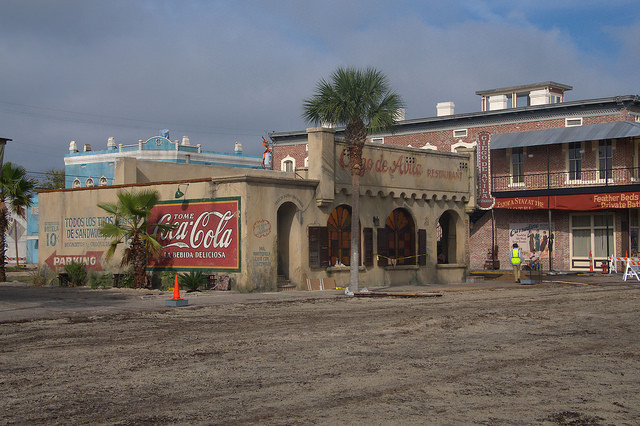 Across the street, an empty lot on the corner of Newcastle and Monck has taken on a whole new appearance, with the ground-up construction of Ciego de Avila, representing a restaurant of old Ybor City. Everything was on the move, from tables to sand. More about the sand in a bit. 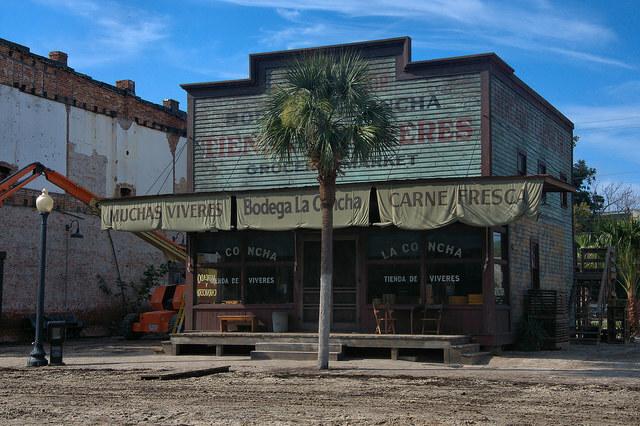 A little further down Newcastle, just past Ciego de Avila is this newly constructed prop, the Bodega la Concha. It’s one of my personal favorites. Back across the street, detail work was being done on more storefronts. 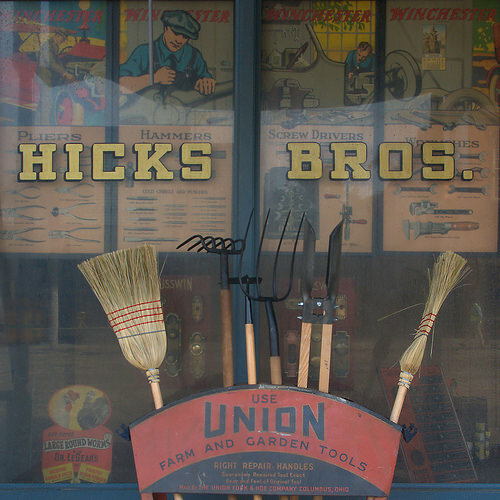 The Hicks Brothers Hardware Store, seen below, should be familiar to those who grew up in the era of independent local retailers, all too rare today. 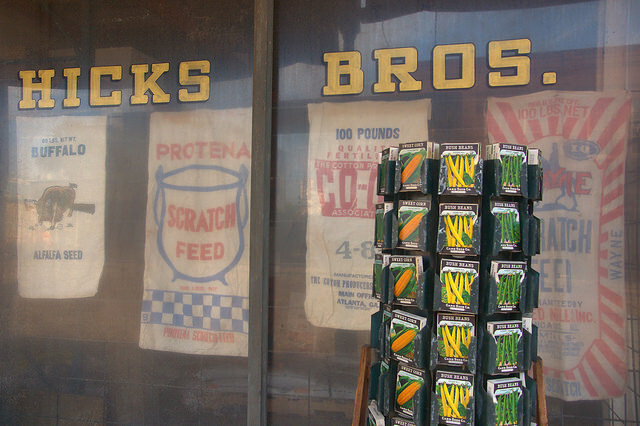 They even had an old seed display. 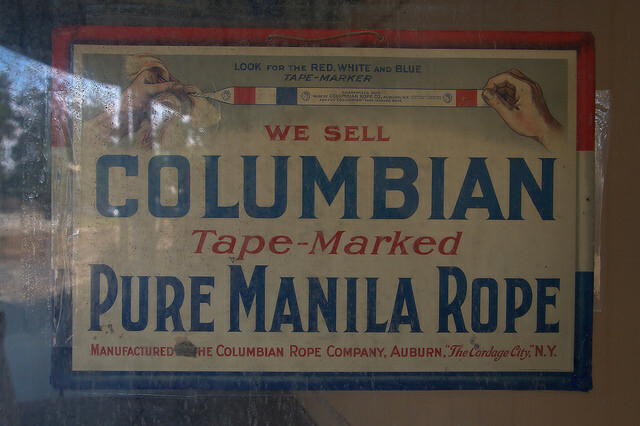 And this cool sign for Columbian Pure Manila Rope. 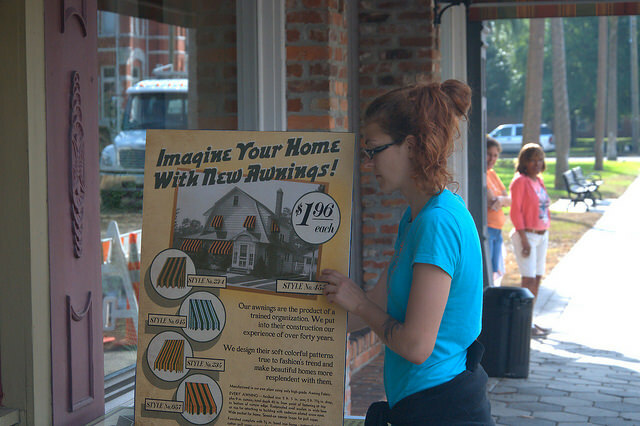 This prop worker was making final tweaks on a cardboard advertising sign and was patient with me taking her picture. 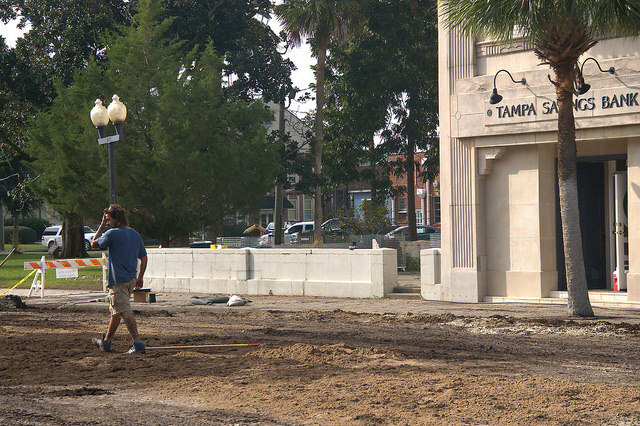 Just across the street, Tampa Savings Bank and Ybor Iron Works are taking shape. 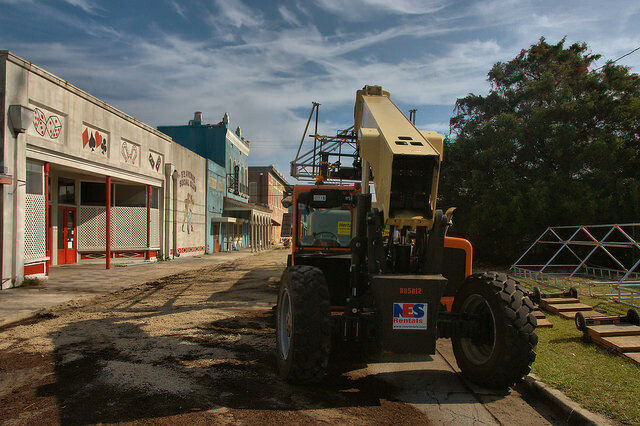 Some of these structures have been empty for a long time, and Brunswick friends have suggested that they’re happy to see any improvements, even cosmetic ones. 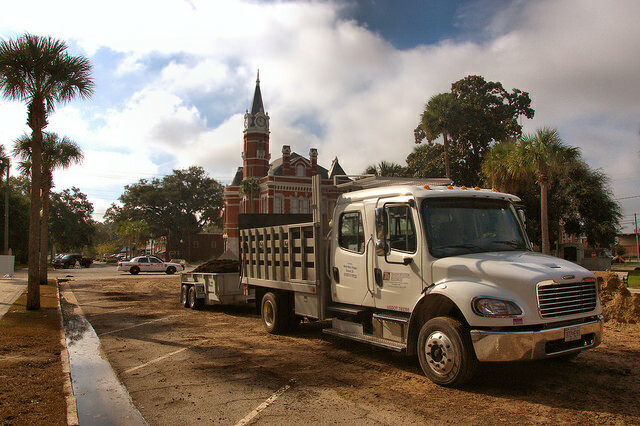 Brunswick’s magnificent Historic City Hall (seen here behind a Warner Bros. “dirt truck”), on the south end of Newcastle Street, is essentially camera-ready and slated to appear in the movie, as well. 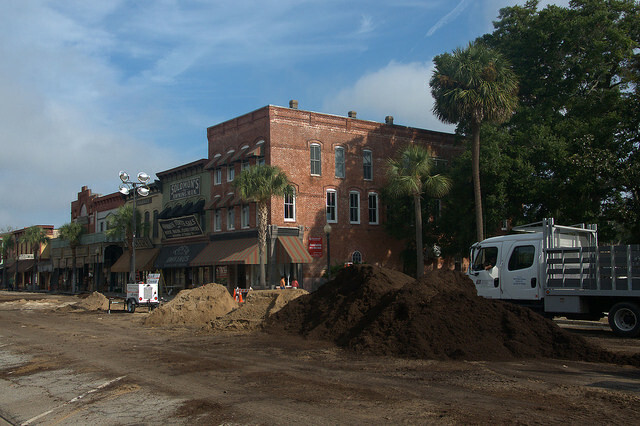 These trucks and lots of hard labor are spreading dirt all over the street surfaces that will appear in the film. 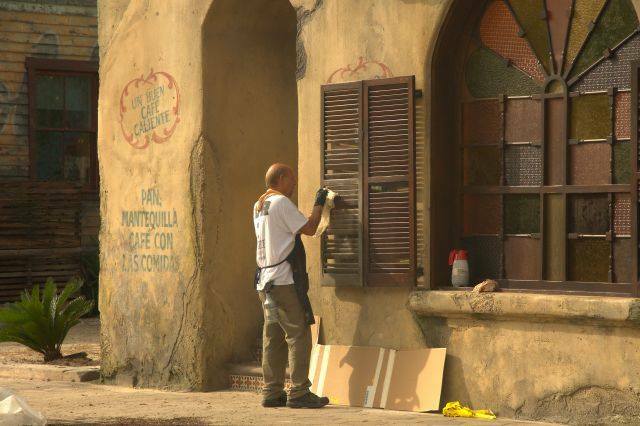 Working my way back up Newcastle Street I was happy to see the Spanish Coca-Cola mural on the side of the Ciego de Avila Restaurante. There was more detail work being done on that structure. It seems to be never-ending. Back at the corner of Newcastle and Monck, there’s this great view. 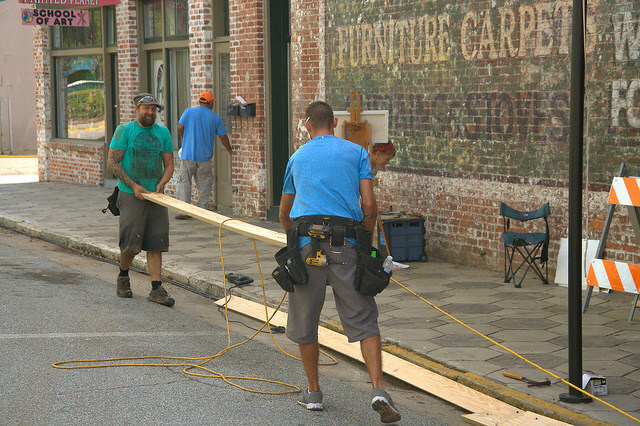 And more workers securing the set. 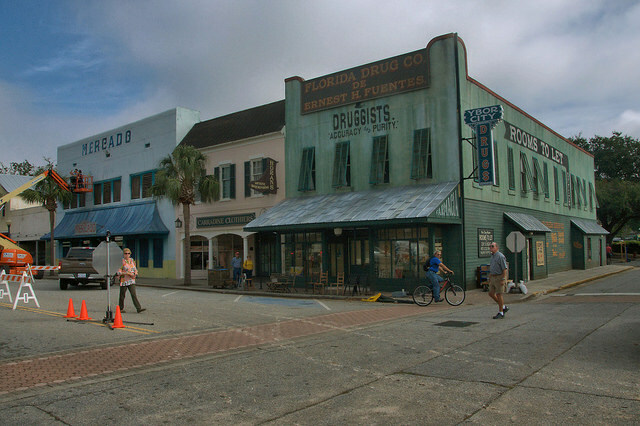 Monck Street should feature prominently in the film. 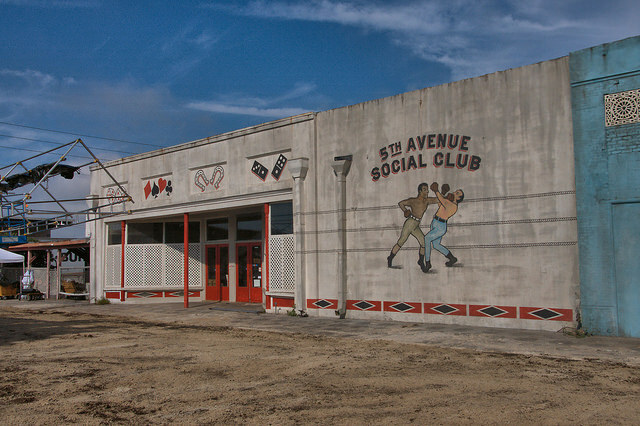 Besides this wonderful recreation of an early automotive garage, there’s the 5th Avenue Social Club, surely a favorite of the criminal elements integral to the story. And finally, looking down Monck toward Newcastle. If you’re curious about the movie, you can read Dennis Lehane’s book, or visit IMDB, where this anonymous plot summary was first posted: Boston, 1926. The ’20s are roaring. Liquor is flowing, bullets are flying, and one man sets out to make his mark on the world. Prohibition has given rise to an endless network of underground distilleries, speakeasies, gangsters, and corrupt cops. Joe Coughlin, the youngest son of a prominent Boston police captain, has long since turned his back on his strict and proper upbringing. Now having graduated from a childhood of petty theft to a career in the pay of the city’s most fearsome mobsters, Joe enjoys the spoils, thrills, and notoriety of being an outlaw. But life on the dark side carries a heavy price. In a time when ruthless men of ambition, armed with cash, illegal booze, and guns, battle for control, no one-neither family nor friend, enemy nor lover-can be trusted. Beyond money and power, even the threat of prison, one fate seems most likely for men like Joe: an early death. But until that day, he and his friends are determined to live life to the hilt. Joe embarks on a dizzying journey up the ladder of organized crime that takes him from the flash of Jazz Age Boston to the sensual shimmer of Tampa’s Latin Quarter to the sizzling streets of Cuba. Live by Night is a riveting epic layered with a diverse cast of loyal friends and callous enemies, tough rumrunners and sultry femmes fatales, Bible-quoting evangelists and cruel Klansmen, all battling for survival and their piece of the American dream. At once a sweeping love story and a compelling saga of revenge, it is a spellbinding tour de force of betrayal and redemption, music and murder, that brings fully to life a bygone era when sin was cause for celebration and vice was a national virtue. 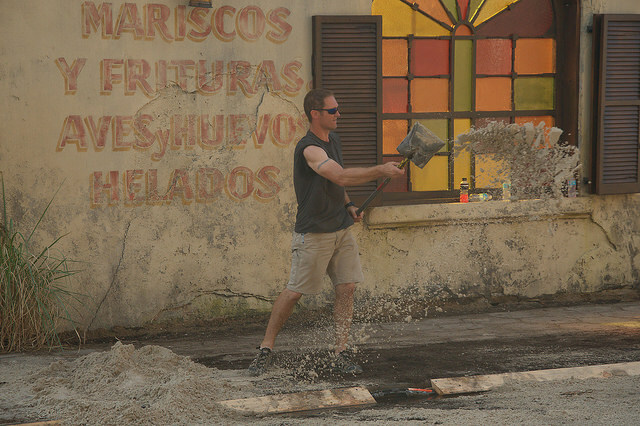 Brian, we were there last weekend and loved seeing the transformation! Everybody we talked with wanted it to stay that way. Thanks for these awesome photos! 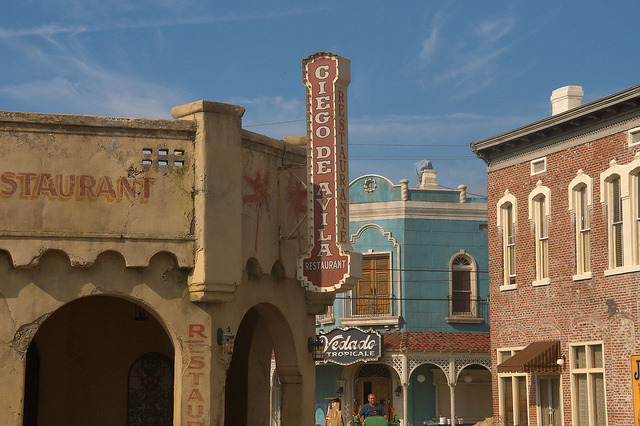 WOWZER….Just enjoyed a Class Reunion in my Old Home Town and never saw the Hollywood Effect happening……..GOOD for GLYNN !!! I have a farm about 5 miles from PINEWOOD in Fayette and havent seen this much goings on in a good while !!!! Happy Hollywood-ing !!! I will Always Love going Home !!!! I work in Brunswick and have been anxiously watching the amazing transformation. 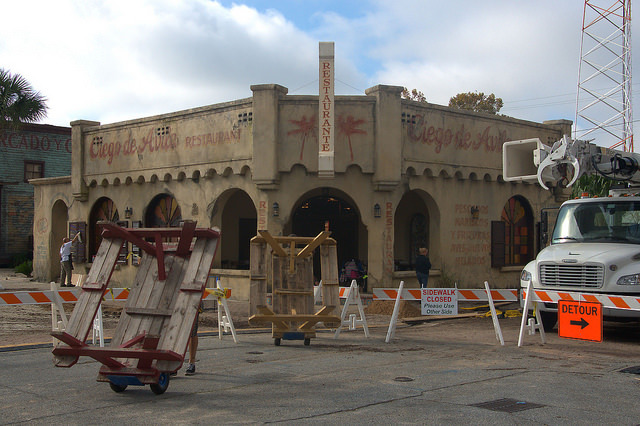 Hope to see some of the filming next week. So glad Ben Affleck decided to do this in Georgia instead of Florida. 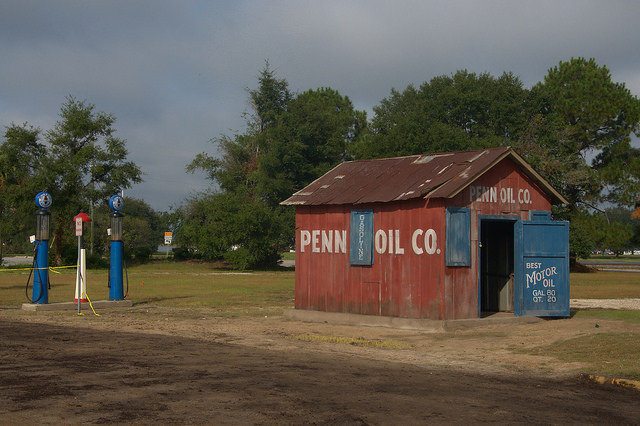 Just another feather in the “Golden Isles” cap. Thanks Ben! Wonderful photos – great you were able to see the transformation. Now I can’t wait to see the movie… thanks! Wonderful! Can’t wait to visit Brunswick again! Thank you for the pictures!